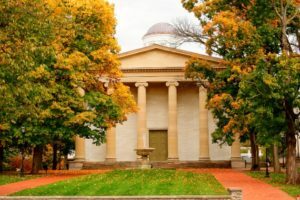 The quiet little Capital City of Frankfort, Kentucky has recently been blessed with new opportunities and a fresh start for revitalizing downtown near the Old State Capitol. Frankfort is unique in that the Kentucky River flows right through the middle of town. For many years the Frankfort community has participated in meetings and paid for studies on revitalizing the downtown and developing the riverfront, but no significant action has taken place to revitalize the downtown in the last 40 years. The riverfront area is therefore still underutilized. Recent state government actions have initiated change in downtown Frankfort and now the local governments are scrambling to take advantage of this great opportunity. 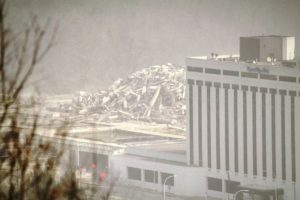 The Commonwealth of Kentucky (Commonwealth) has razed several unsound, inefficient structures downtown known as the Capital Plaza. 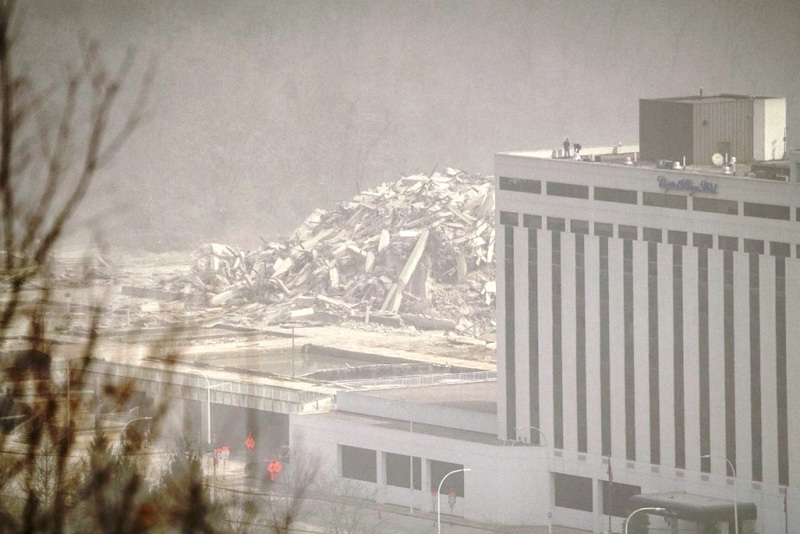 The Commonwealth razed a state government office tower, a convention center, shops and a parking structure. Other structures remaining on the state government owned land known as Capital Plaza area are a YMCA with parking, the Capital Plaza Hotel and the Farmer’s Market. These remaining entities lease the land from the Commonwealth. 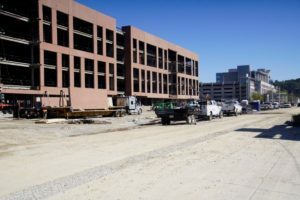 (In the hotel land lease, the Commonwealth is committed to maintaining a 150 space covered parking structure and honoring a non-compete clause that prohibits another hotel from being constructed within 1 mile of the Capital Plaza Hotel on Commonwealth property.) Only a portion of the land, that had structures razed will be reused by the Commonwealth. 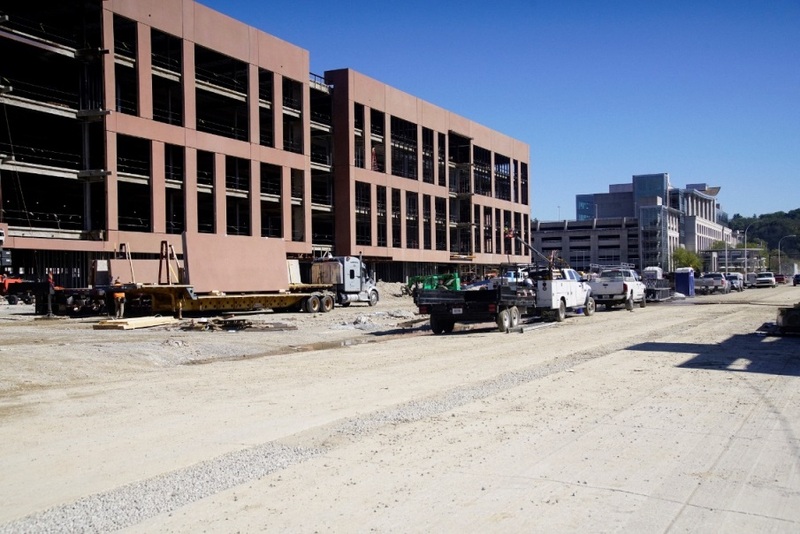 The 6.408 acres of property that is referred to as parcel B is currently being used for a staging area for a new state government office/parking facility. Once construction is complete, parcel B will be surplus to the Commonwealth’s needs. Therefore, the Commonwealth has initiated a plan to transfer parcel B to a private entity making parcel B subject to local property taxes to support the local community. There are other Commonwealth and city owned properties in this immediate area that are not part of parcel B but which are ripe for redevelopment to contribute to downtown Frankfort’s revitalization. The Old Capitol in downtown Frankfort. Frankfort is an historic town with many stories to tell. Some of the most interesting stories come from this area of downtown where in the year 1900, William Justus Goebel was gunned down by a political assassin in front of the Old Capitol. He served only 4 days as Kentucky’s 34th Governor. In 1798 the Kentucky State Penitentiary was constructed in Frankfort and later renamed the Kentucky State Reformatory. The reformatory came to be known as the Nation’s model of prison reform under President Franklin D. Roosevelt and Kentucky Governor A. B. “Happy” Chandler. Located just west of the reformatory and near the Kentucky River was a 50-acre neighborhood of swamp land called “Crawfish Bottom”, also known as “Craw” and “Bottom”. This area became known for gambling, prostitution, bootlegging and about any crime you can think of. Even though this was an area you wouldn’t want to walk through unarmed at night, it was a close-knit neighborhood which didn’t concern themselves with racial segregation or status. During the 1960s and 70s, low income government housing was developed in suburban areas. Many residents living in Crawfish Bottom were relocated and the Commonwealth of Kentucky acquired all their flood damaged homes and businesses to construct Frankfort’s new Capital Plaza. This modern 70’s design consisted of a 29-story office tower, parking structures, a convention center, shops, a hotel and a YMCA. The Capital Plaza Tower and the fountain area with shops on the same level as the rear hotel entrance. Photo by unknown. The tower didn’t receive the maintenance required for sustainment and began to deteriorate to the point of becoming unsafe as the years progressed. This 1970’s era construction also consisted of a large concrete open space that served as a roof for the shops and offices underneath. This structure frequently leaked, causing maintenance issues and unhealthy conditions. 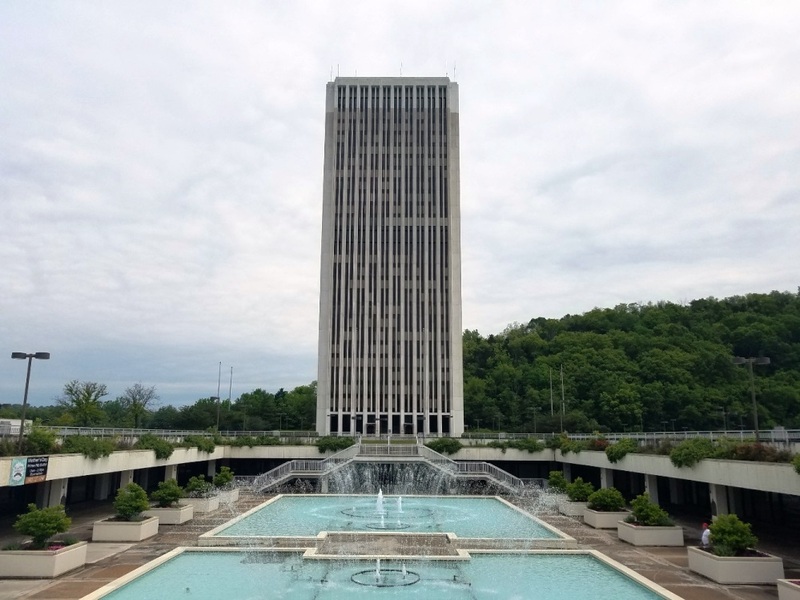 The design of the Capital Plaza was internally efficient but severed itself from the surrounding community, cut off from historic downtown Frankfort. As in most Capital Cities, state government owns many acres throughout the county, most of which is in downtown Frankfort. 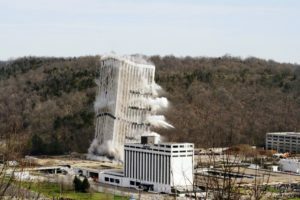 For the past 15 years the Commonwealth has pondered what to do with the unsafe office tower near the Old State Capitol. The current state government administration decided it was time to act. 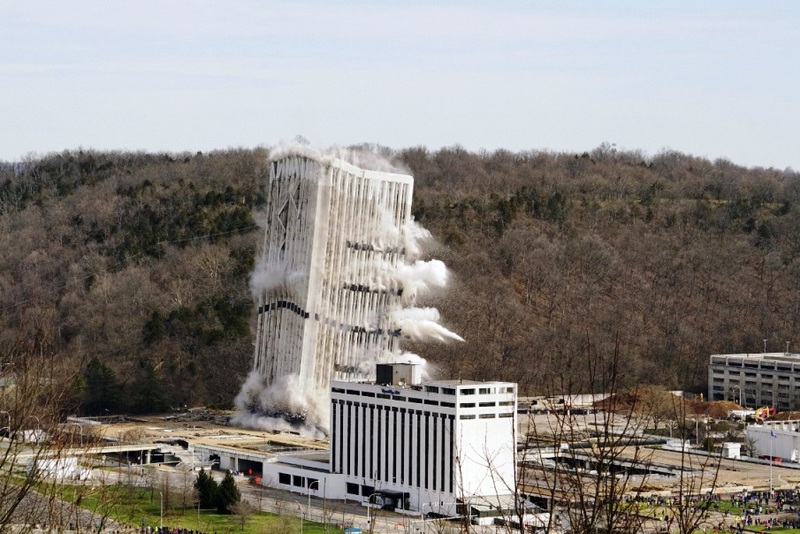 The Capital Plaza Tower during implosion. Plans began to raze the tower structure and replace it with a structure which better fit the scale of historic downtown Frankfort and which was much more space efficient than the tall, thin Capital Plaza Tower. While few locals really cared about replacing the tower, the Commonwealth also determined that along with the tower, the convention center and shops would be removed. The decision to remove the convention center was met with substantial local resistance and became a partisan issue for state and local politicians. As with most convention centers, this one was not a money maker in and of itself but generated revenue for surrounding businesses. The facts are that the convention center was outdated and unmarketable due to its basketball arena design with no break-out rooms for large conferences. The convention center cost the Commonwealth more than one million dollars per year to operate with no benefit to state government. While some local businesses benefited from the convention center, the Commonwealth could not afford to invest millions into renovating the outdated facility. A several million-dollar renovation would have been necessary because the central plant which supplied electric, heat and cooling to the tower and convention center were combined and could not be easily separated. Bringing the convention center up to code would have required new electric service, fire suppression and a new HVAC system as well as other renovations necessary to comply with Americans with Disabilities Act and other marketing enhancements. All these factors played key roles in the decision to raze the convention center and shops along with the tower. The Commonwealth needed to replace the office space lost in the razed tower and elected to fund this new office building and parking structure through creative financing called “Build to Suit”. KRS 56.820 of the Kentucky Revised Statutes allows for this type of delivery method. The Commonwealth selected a developer through a public process that evaluated several proposals from potential developers. Once the successful developer was selected, the Commonwealth conveyed the property to that developer. The selected developer secured funding for the construction of the project. The developer will then construct the facility as proposed, a process already well along. Once the new facility is complete, the Commonwealth will lease the facility from the developer and after 30 years the property transfers back to the Commonwealth. The Commonwealth will pay nothing up front which will not burden Kentucky’s credit rating. The Commonwealth will pay for the utilities, but the developer will pay for maintenance of the facility. The savings that Kentucky will realize in utilities alone, compared to the utility costs for the tower, will greatly assist in making the lease payments for the new facility. This new facility will engulf all the property that was cleared in the demolition except for parcel B. Once parcel B becomes available, the goal is to put the property back on local property tax rolls. The office building replacing the Capital Plaza Tower, under construction. The Transportation Cabinet Building is in the background. The Commonwealth has two options for putting parcel B back on the local property tax rolls. One option is to sell parcel B to the highest private entity bidder which would accomplish this initiative. However, the Commonwealth has elected to pursue a second option. The Commonwealth has asked the City of Frankfort (City) and the Franklin County Fiscal Court (County) to engage the local community for their recommendations for a land use plan for parcel B. The Commonwealth suggested using a recently established statute, (KRS 65.028) Public Private Partnership (P3) delivery method, to ultimately transfer the property to a private developer. A P3 would give the community more control on what is developed on parcel B. The successful developer will be determined through a public hiring process open to all qualified developers. Typically, the first phase would be a Request for Qualifications (RFQ). The RFQ is a request for interested developers to submit their company’s information to include resumes of staff, past developments they have completed, current projects they are working on and references. A selection committee will review all submittals and eliminate the companies that do not meet the requirements. Once a group of vetted developers is determined, the selection committee will issue a Request for Information (RFI). The RFI will require all developers to review the community’s plan and then meet individually with the selection committee to discuss the pros and cons of the community’s plan. It is important that these meetings take place in closed session so that each developer’s original ideas are kept confidential. Information gathered during the RFI phase will let the community know what is feasible and what is not. The Frankfort community certainly does not need submitted proposals which do not meet the requirements. The RFI phase provides a better opportunity for a solid contract and fewer questions during the Request for Proposal (RFP) phase. The RFP will include the revised community plan based on what developers indicated was economically feasible during the RFI phase. The RFP is detailed and includes specific directions as to what is required to be included in the proposal. No payment to the developer is required other than the land be conveyed to the developer fee simple. This process, however, has been modified by Frankfort local officials who combined the first two phases and called it an RFI but no confidential information is shared. Also, local officials advertised in the local paper only and allowed just two weeks for submittals which limited responses. Current information from the Frankfort State Journal indicates that the RFI process will be conducted in secret. The Frankfort/Franklin County Planning Commission (FFCPC) is instrumental in the development process of parcel B. The current zone classification is Special Government (SG). For a developer to implement the community driven plan, a new zone classification will need to be adopted. This new zone classification is called Urban Mixed Use (UM). The new zone will include standards for building materials and building setbacks which will, among other standards, prohibit vinyl and encourage masonry veneer. The setback requirements will be set to zero and building heights limited to the height of surrounding structures. It is the intent of the Commonwealth to return the surplus property to the community which would require an agreement between the Commonwealth and the local governments. The Commonwealth approached local governments to sign a memorandum of agreement (MOA). Local officials delayed for over 6 months before returning a modified MOA that split parcel B into lots and mentioned using tax increment financing (TIF). It made no mention of using a Public-Private-Partnership (P3) method of delivery. The Commonwealth quickly returned the MOA which was very similar to the original and reminded local officials that the property in question is state property and if the local community was interested in deciding on how parcel B is developed, local officials would need to submit to the Commonwealth’s requirements. The local officials eventually acquiesced and the MOA was signed. Included in the MOA are the two commitments the Commonwealth has to the Capital Plaza Hotel. (To replace a 150-space parking structure which was demolished along with the tower, convention center and shops and not plan on another hotel on any Commonwealth owned land.) The Commonwealth required the local governments to include this hotel parking structure in the RFP for the redevelopment of parcel B. The Commonwealth mandated that the community be responsible for dictating the land uses in the redevelopment plan for parcel B through a public input process. As a 22-year member of the Frankfort/Franklin County Planning Commission and a 30 year state government employee, I took a special interest in seeing this project materialize effectively and as transparent as possible. Local officials selected a working group (the group) to facilitate the community input process lead by Frankfort’s city manager. Local officials decided to hire a consultant and include the entire downtown area in the consultant’s recommendations. The group and consultant proceeded to conduct closed meetings. After several email attempts asking for the meetings to become public, I wrote a letter to The State Journal (local newspaper) editor criticizing the group for lack of transparency. The meetings became public but the group continued to privately and publicly meet with different stakeholders. However, minutes of those meetings are not made public. Therefore, the group controlled the information being collected to develop the plan. The group held the first public forum and instead of allowing citizens to speak on what they thought would be in the best interest of the community, a series of questions were displayed on a screen. “Clickers” were given to each citizen that elected to participate to answer multiple choice questions. This type of “public forum” was conducted twice. At the third “public forum” the plan was revealed by the consultant. Very little open public input was ever allowed in this process. Even though a facility to replace the convention center was discussed, it was not part of the final plan. I continued with a series of letters to the editor, criticizing the group and making suggestions. I was just recently removed from the planning commission. The plan was presented by the consultant in a public forum although public discussion didn’t take place. The plan not only omitted a parking structure for the Capital Plaza Hotel but proposed a new hotel to be located at the current Farmer’s Market location which is property owned by the Commonwealth. Both of these elements of the plan are in direct violation of the MOA. The plan includes residential development on parcel B with some commercial on the ground floors of some buildings which is not a bad idea. However, the consultant indicated the construction would be based on market demand. There is currently not a documented market for downtown residential so the build out could take 10 years or more. I believe the intent of the Commonwealth was to develop something on parcel B which would draw in new downtown residents. There are some positive elements to the plan such as sprucing up the railroad that runs through the middle of downtown, making one-way streets two-way again, refurbishing a closed bridge for foot traffic and connecting a street grid to historic downtown. It is unknown if the Commonwealth has reviewed or approved the plan, however, the group has initiated an RFI to developers without planning commission, Franklin County Fiscal Court or City Commission approval. Since editorials to the local newspaper are limited to 500 words and I have much more to say, I sent several. One letter explained how to obtain a free convention center. As earlier stated, a convention center in and of itself is not a money maker. However, if enough land was made available to the P3 developer then that developer could construct a convention center as payment for the land. Six acres is not enough land to construct a hotel parking garage, convention center and the money making structures. However, if the other Commonwealth owned land where Farmer’s Market and the YMCA are located is included plus the riverfront properties the City owns, a large development that could generate enough revenue to include a convention center is possible. Even more money could be saved by locating the new convention center over the mandated hotel parking structure. The Farmer’s Market could be incorporated into the redevelopment or relocated to another prime area of town. The YMCA could be part of a condominium complex that would require fitness, a pool and other amenities anyhow and YMCA dues could be part of the HOA fees. One idea coming from the group is utilizing Tax Increment Financing (TIF). TIF is a financing tool which freezes the existing property and occupational tax amount, currently $0 for parcel B. Parcel B is Commonwealth owned and state government does not pay local property tax. Once the property tax amount is frozen, the City would sell bonds and use the bond money to inject those funds into the development. When the development is completed, property taxes would greatly increase. Instead of the property taxes going toward local schools and infrastructure, they would go toward repaying the bonds for that development if a TIF is used. TIF is a good idea for a poverty stricken, crime infested area of town that no developer would dare invest in. However, downtown Frankfort does not have those issues and developers will likely be knocking down the door to invest in parcel B and surrounding properties because it is adjacent to state government offices where thousands of employees work every day. The amount of property tax revenue for parcel B depends on what is developed there but could be more than $1M per year. Wouldn’t it be better for those funds to be used in the local school system to teach our children rather than pay bonds that subsidize a developer? The group is not looking at the overall resources which could be combined into one large development to get a free convention center at minimal, if any cost to taxpayers by utilizing the P3 regulation. Local elected officials are turning a blind eye to the group’s actions. 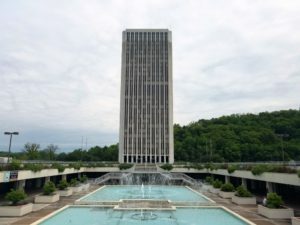 It does not appear that the group is effectively communicating with state government officials, YMCA representatives, or the owners of the Capital Plaza Hotel. These entities are all major stakeholders in the revitalization and redevelopment of Kentucky’s Capital City. Maximizing potential can only take place when communication lines are open and every stakeholder’s interests are considered. If Frankfort, Kentucky wants to get serious about this once in a lifetime development opportunity for our community, we need to seriously consider including all the government owned land into one RFP. A developer will be able to make enough profit on the residential and commercial properties to include a conference center and other public use areas. This will draw visitors which will use all local businesses thus sustaining and enhancing the entire downtown. Consultants suggest that Frankfort doesn’t require a large conference center for economic viability. Rather, a small venue gathering place is recommended. Frankfort is the Capital City and every Capital City should have a convention center, especially when you can acquire one a little or no cost to the taxpayers. Allow your professional planning staff and your planning commission to facilitate the process. They are the experts in obtaining, recording and distributing public input. The planning commission is made up of both city and county members for equality and impartiality. Hold public hearings to record public input and not limit public discussion to preselected questions and answers. This will take longer but the process is not a race. The citizens need to feel like they have been heard to support the plan and goals for your community. Ensure public input from all citizens and stakeholders is recorded and made available to the public to be transparent. Select a diverse sub-committee for selecting consultants and developers and ensure members are not beholding to special interests. Think big and shoot for the best development(s) possible to get the most for your money. Your RFI process will tell you if the plan is economically viable or not. Do not segment your overall potential by splitting up available land into parcels. Advertise nationally and include as much property as possible for the developer and then ask for your community needs in return. Keep the process open to the community. If there are other funding resources such as grants or deep pocket corporations that want to name a building or facility, see how we can incorporate those funds into the plan. I want to thank my friend Dr. Roger Strunk of Frankfort for pictures and other contributions to this article. Unless otherwise credited, all photos are courtesy of Roger Strunk. 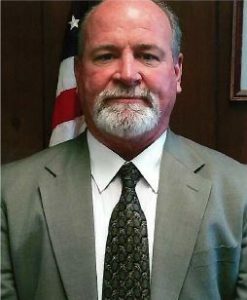 Joseph D. Sanderson is a Facilities Division Director for the Department of Military Affairs for the Commonwealth of Kentucky, and a lifelong resident of Frankfort. He is responsible for 160 employees, 12,000 acres and 3,000,000 square feet of covered floor space supporting the Kentucky National Guard. He has over 30 years experience in property management for state government. He has been a licensed plumber for 35 years and has owned his owner plumbing business since 1989, Sanderson Inc. He has negotiated many land purchases, mining agreements, leases and other land initiatives for the National Guard. He has also managed many projects ranging from major maintenance to a $129M hospital construction project. Joseph was a long time planning commissioner for Frankfort/Franklin County Kentucky serving as Chairman appointed three 4 year terms by the county and three terms by the Governor. 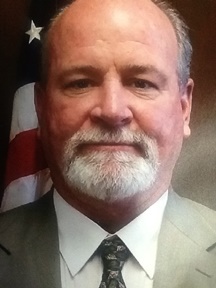 Prior to that he served two 4 year terms to the zoning board of adjustments appointed by the city. Recently he has taken on the role of holding city and county officials accountable for transparency in redevelopment of a large section of downtown Frankfort. Joseph has advised many local candidates running for public office and has written several articles in The State Journal, a local newspaper, regarding planning and zoning issues.